Jazz has always been understood as a synthesis of diverse musical concepts from African music and European classical music, interpreted through the lens of the black experience in rural and urban America in the early 20th century. Elements of European harmony, melody, and form arrive through different routes--some directly, through the influence of composers such as Bach and Debussy, and some indirectly through the distillation of the popular song in American culture. Melodic forms in jazz take after the forms of "continuous variations" such as the passacaglia and the chaconne, where recurring motives, both explicitly stated and implied, supply the grounds for invention. One of the European forms that is, by its improvisatorial nature, most friendly to jazz turns out to be one of the most overlooked, and that is the form of fantasia, and it is from this form that the music on this recording is derived. The baroque forms of fantasia as exemplified by Bach, the consummate improviser, are taken part and parcel along with Bach's many musical contributions, and are rarely considered separately. In the early 20th century, however, one finds the fantasia reinterpreted by classical composers in the light of a burgeoning Modernism. The new poetics of Modernism speak of the issues of the mechanized, industrial age, and of the often-brutal life in the cities, cities straining to accommodate crowding and the needs of an increasingly diverse populace. Poetically, it is in Modernism that we find modes of expression that are still relevant to our condition now, in the early 21st century. There are only a few threads in modern jazz that come to mind that take early 20th century fantasia as a starting point. It figures throughout Ellington's work. You can hear it in some of Bud Powell's solo performances, as well as in Herbie Nichols' "Infatuation Eyes." Listeners will surely have further examples ready at hand, but in totality, I think there are relatively few. 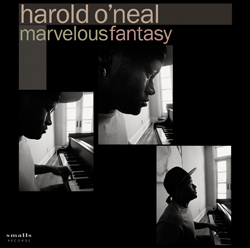 The program Harold O'Neal has created here might be the most acknowledged interpretations of the early 20th century fantasia undertaken by a jazz musician to date. Ravel is cited as an immediate influence on the compositions here, but the listener might also be reminded of Debussy and to some extent Satie. At the same time, this is a jazz record by a jazz pianist, but one would be pressed to point to an influence in the history of jazz. In "The Lovers" one can hear echoes of Ellington, whereas other pieces, considered as jazz pieces, appear to have sprung more directly out of the realm of fantasia. But all of these pieces are inextricably bound up with O'Neal's own emotional and poetic sensibilities, which flow very freely here throughout. These sensibilities supply the driving force that makes this music succeed as a genuine musical/poetic synthesis that excels over the preponderance of mere -- as in mereological -- eclecticism that dominates much of today's jazz. Harold O'Neal is not one to shrink from a challenge, and in many ways is prone to make the challenges that he poses for himself the most difficult ones. [Casting agents and directors take note -- you could go very far with this multi-talented artist.] For this project, I feel O'Neal dug deep down inside himself and came up with the most important thing: having something to say, and saying it poetically. While this is a record by a jazz pianist, there is also a sense in which stylistically "it's just music," to quote Ellington, "it's what we do." Many fans of early 20th century classical music will also feel a kinship with this music I think. Since there is no "just music" section in the store, you can look for this record in both the jazz and classical sections. "Some of my earliest musical inspirations came from when I was a child watching films and television. I was not aware of any particular "style" of music, and I was certainly not a musician at that time either. Yet I could feel and understand the connection between what I was hearing and what I was seeing. It was at that time that I realized the function that music performed within the world on screen. The life of the work was easily accessible. I fell in love with classical music, jazz, rock, and really all types of music. The style didn't matter just as long as I could feel it. My goal with Marvelous Fantasy is to journey with the listener side-by-side on a path of full life experiences reminiscent of youth's first adventure. From the tale of Atanos The Great to the mysterious dance in the pale moonlight, and from Mr. Piccolo's adventure to when the lovers first meet. Each piece is an entire world within itself." The producer and artist would like to give deep thanks to Larry Fink for his beautiful photography and abundant inspiration.